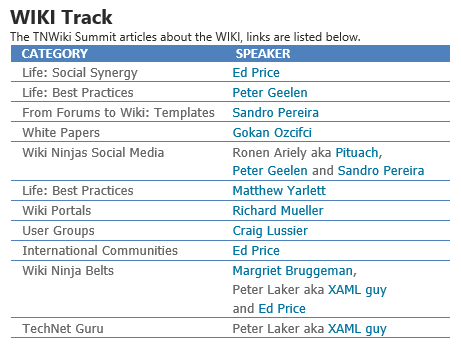 TechNet Wiki Summit – This is for You! First things first. This Summit is for you and is Free to attend! Go to this page and register. Have a look here at what this Summit has to offer you. Date: March 17-18-19, 2015. Well with that done let me explain a little about TechNet and TechNet Wiki. 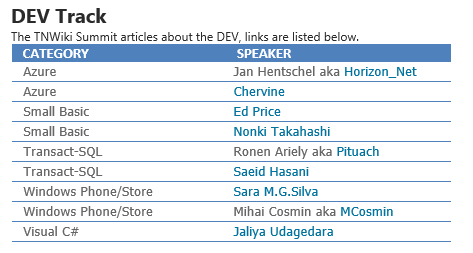 One of the things I like to do when I have some spare time is write blog posts about the technology is use in my work related activities. Before you can answers questions or help people with their technology related issues you have to gain the knowledge yourself. 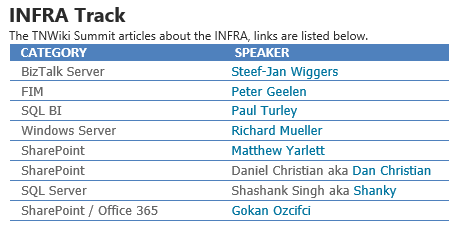 Well let me tell you the TechNet environment is just the place to start. Whether you just want to absorb or really want to participate this is the place to be. Now have a look. The Home page does offer some interesting options. But have a look at the menu bar. That’s where the real magic is. The Third option “Wiki” has a ton of information at your disposal. Credo here? Can’t find it – Write it! How cool is that. Let me tell you, this is not the place you explore in a couple of minutes. There is so much going on that might take you a while so here’s the tip: bookmark this place and come back regularly. All activity you see here is done by enthusiasts, evangelists and people who want to be involved. You can be a part of that as well. Tip: half way down this page you will find a link to the Wiki Ninja’s blog. Have a look there and see how much activity is going on! So what could this option be? Some sort of show off directory what everyone is doing? No way this is the place where enthusiasts share their knowledge. Thousands of free downloads contributed by volunteers. Looking for a script to print all AD users to an Excel file? It’s here. Looking for free Powershell scripts? It’s here. Go on have a look and see what’s available for you. I’ll bet you find what you have been looking for all this time. Same credo here… can’t find it, write it and contribute it here. For years I have been active in Forums and this one is no exception. Users from all around the world post their questions here and it is up to the community to answer them. Let me tell you if you post a question here it will be answered! Forums are the place where you go to if you have a question and would like some help from other people who just might know the answer. Just about every IT related subject can be a topic. I have to say that by just reading answers from all those volunteers you will gain a lot of knowledge as well. Best thing would be to participate. And don’t be fooled you will be taken seriously here no matter how simple the question might be. Well all I have to say now is I’ll be there… will you? This entry was posted in Office Tips and Tricks, Toolbox and tagged Forums, gallery, Summit, TechNet, Technet Home, TechNet Wiki, Wiki, Wiki Ninja, Wiki Summit on February 28, 2015 by Maurice.